Updated Tuesday April 16, 2019 by Denis Archambault. See our LEAGUE HOME PAGE for our Online Registration. Click on the image below from our LEAGUE HOME page to start your online registration process. Includes 10 sessions, full uniform (sock, shorts and jersey), souvenir and year end festivities. Sessions are Saturday morning in local arenas from mid April until late June. Cost: $149.00 after March 31st . 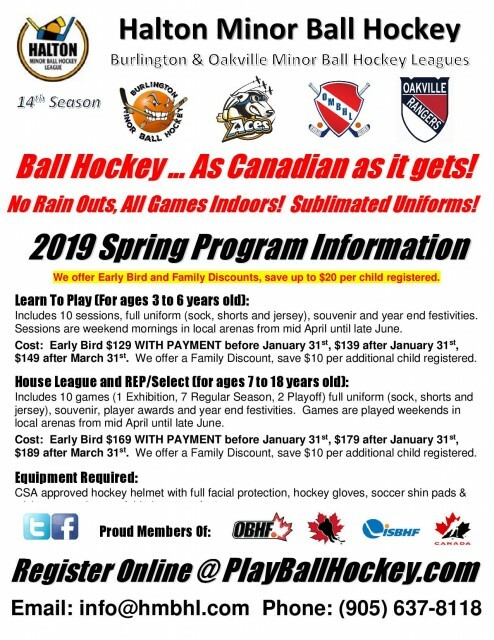 Includes 10 games (1 Exhibition, 7 Regular Season, 2 Playoff) full uniform (sock, shorts and jersey), souvenir, player awards and year end festivities. Games are weekends mostly Saturday with the odd Friday or Sunday game, all played in local arenas from mid April until late June. Cost: $189 after March 31st. CSA approved hockey helmet with full facial protection, hockey gloves, soccer shin pads & stick are mandatory. Athletic cup, soft elbow pads and knee pads are also recommended. We offer the opportunity to try out for our BMBHL Provincial Teams or even Team Canada. See our Programs Offered page or Registration Information page for more detailed information.